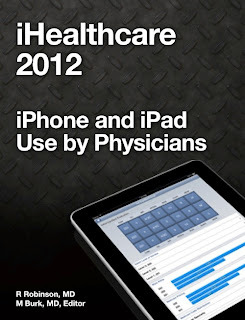 A new ebook detailing how healthcare professionals use iPhones and iPads has been released in the iBookstore. Data from numerous surveys and peer reviewed articles on mobile device use are presented with clear, eye catching graphics. iHealthcare will be a great asset to anyone evaluating iOS devices for use in medical education or medical practice. iHealthcare can be downloaded from the iTunes iBookstore.